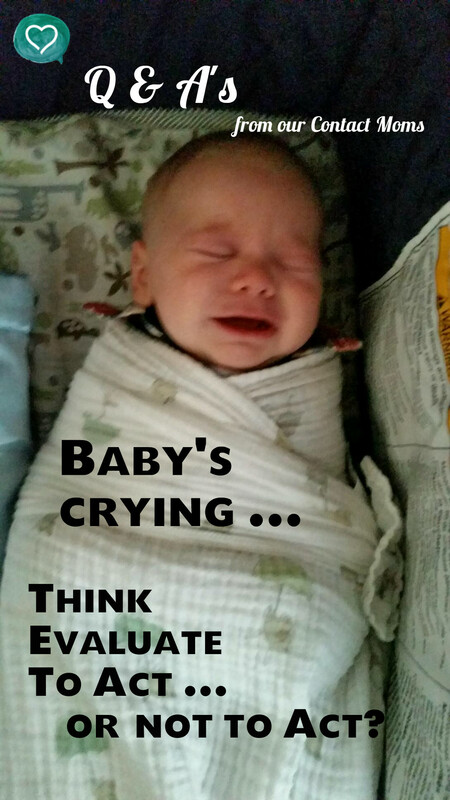 It is very hard for me to hear my six-week-old baby cry. How do I know when it is time to intervene? How do you determine when it is time to intervene when your baby cries? Take heart, you are not alone! For a new Mom, listening to their baby cry is heart-wrenching. They think their sweet little one will cry themselves to death. But they won’t, they just sound so pathetic to the untrained ear. How do you train your ear? That is a question we can help you answer. Please, stop and remember that it is very important for babies to cry. According to babycareadvice.com newborns cry an average of 1 ½ hours per day (remember some will cry more, and some less). At 6 weeks of age your baby could potentially cry 3 hours or more/day. And at 6 months, it is still normal for a baby to cry 1-2 hours/ day. It is not a measure of your abilities as a mom. Think before you enter in or intervene; is the cry intermittent? We call this smart crying. Your little one is saying, I am not quite ready to settle, but I also don’t want to exhaust myself crying non-stop. Evaluate the 4 H’s (Hurt, Health, Hunger, Habit). Where are they in their routine? Is something causing pain or could they be too hot/cold? Could they have a stuffy nose? Did baby take a full feeding before nap/bed? Or have they developed a habit of waking early? For example, if they are consistently waking exactly 15 minutes into their nap and crying, it may be that baby is used to you intervening and that you have a pattern that needs changing. Further, is the cry one of real need or simply disappointment? A real need is when baby cries and you go in after a few minutes and discover a big burp or more. Or perhaps you realize they woke up because the dog barked or a noisy truck drove by. But if (after you go in, pick them up, and offer comfort) baby stops crying and then begins again the moment you set him down, you know they are simply disappointed. Reflect on your goal to train them in the skill of settling themselves. Be cautious, too much intervention could rob your little one of learning this important skill.